National Institute of Open Schooling (NIOS) www.nios.ac.in is conducting online Diploma in Elementary Education (D.El.Ed) Programme http://dled.nios.ac.in/ through the SWAYAM Portal www.swayam.gov.in and training 1.5 million in-service untrained teachers throughout India. A broad strategy regarding the training of all such teachers by 31st March 2019 was devised by the Ministry of Human Resource Development www.mhrd.gov.in, Government of India. The orientation of Regional Directors and State Nodal Officers in NIOS Headquarters, NOIDA, India. D.El.Ed Programme is aimed at developing skills, competencies, attitudes, and understanding to make teaching and learning more effective. NIOS has designed and developed Diploma in Elementary Education in ODL mode for untrained in-service teachers at the elementary level. The course started from 3rd October 2017 and will be completed by 31st March 2019. The registrations for the program began on 15th August 2017 and was open until 30th September 2017. The process flow of D.El.Ed. During the month of August 2017 all States and UT’s issued advertisements in newspapers and conducted wide outreach programmes informing all teachers about the opportunity of acquiring minimum qualification to be provided through NIOS failing which their services will be terminated w.e.f.1st April 2019. There have been a series of workshops by NIOS to orient States and UTs. States and UTs submitted complete database of all in-service untrained teachers in Government and private schools to NIOS. See the following link http://dled.nios.ac.in/adminlogin.aspx. On 2nd October 2017, the first batch of material was uploaded by NIOS on SWAYAM portal. See the following link https://swayam.gov.in/search?keyword=D.El.Ed. NIOS believes in reaching its learners through different digital platforms, including its MOOC platform, television broadcast and mobile app. The Programme Guide of D.El.Ed and its Study material is available in nine regional languages of India besides Hindi and English-Telugu, Tamil, Bengali, Punjabi, Assamese, Gujarati, Kannad, Marathi, Odia. Teachers can log in to NIOS dled Web Portal and download the course material for study purpose. The States identified Study Centres and Examination Centres for the successful implementation of the programme. The Personal Contact Programme (PCP) was conducted in the months of December-January in the different States of India. Presently the teachers are filling up the online Examination form. The link is active now. 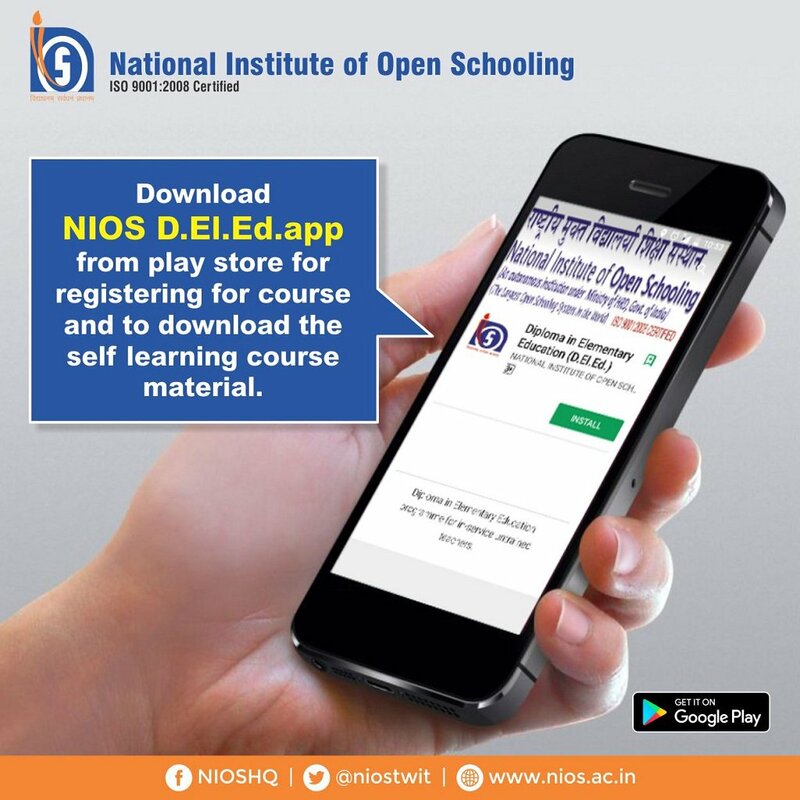 NIOS updates its website from time to time and provides all information to its learners from time to time. To know more about the diploma course visit our website www.dled.nios.ac.in.